You know what stinks? Having golfers elbow when you don’t play golf! I do lift weights three times a week though. So this repetitive motion injury has reared it’s ugly head. Because I’m a personal trainer, I didn’t go straight to Google to look up what golfers elbow exercises I should do. Instead, I went to my forum of super smart NeuroKinetic Therapy practitioners. If you do go to Google, you’ll find most solutions revolve around treating the grip muscles. And they are definitely a player in golfers elbow, but not the only player. You’ll also be told that you need to stretch your forearms. Because apparently if your body is in pain, the only solution is to stretch. (Insert big eye roll right here.) There are lots of cases when you need to strengthen, not stretch, a muscle to relieve pain long term. In fact, 80% of my clients who come to me with knee pain or hip pain or shoulder pain need to strengthen their muscles! And such is the case with solving my own golfers elbow pain. Here’s where I have the advantage of addressing pain — I know about muscle testing. I can test muscles and determine whether they are overactive or underactive. Overactive muscles need to be released with massage or foam rolling. Underactive muscles need to be strengthened. Releasing an underactive muscle with a stretch or massage will perpetuate the weakness. Then you get into a cycle of daily stretching and no improvement because you think it must need more stretching — when it really needs strength! Through muscle testing, I was able to figure out that one of my forearm muscles was weak. That was the painful one. It was also tight. But UNDERACTIVE. Just because it was tight does not mean I should stretch it! 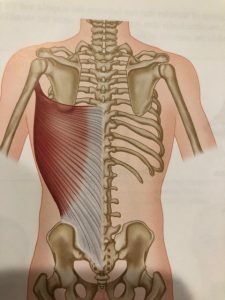 Turns out, my lat (a large back muscle) was the overactive muscle. That’s the one I needed to release. And I need to strengthen my forearm. So here are the golfers elbow exercises I’m doing. I foam roll my lat for about 1 minute. Only on the right side…..because that’s the golfers elbow side. I make sure to get under my armpit too since the muscle passes through the shoulder joint. Then, I use a dumbbell and do wrist curls to strengthen the weak muscles in my forearm. I do about 20 reps. That’s when my forearm gets tired. This can vary a lot from person to person. There isn’t really a set amount of reps you should do. Just do enough to cause your muscle to feel fatigued. This is my particular case. So this protocol may not work for everyone. Other muscles like the triceps and wrist extensors could be involved too. How do you know if you should stretch your forearm or not? Well, you don’t know until you have your muscles tested. Test, don’t guess! But if you’ve been stretching your forearm a lot and not feeling improvements in pain, you’re either stretching the wrong muscle or you need to strengthen instead.